Definition: Increase in the total production cost experienced when an additional unit is produced. Simply stated, is the cost of producing an additional piece. 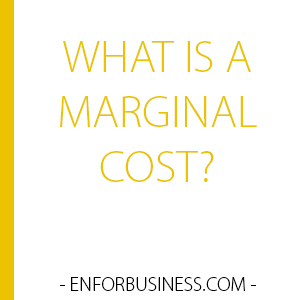 The concept of marginal cost comes from the field of economics, specifically from microeconomics. Marginal costs are important to determine possible economies of scale. Businesses often analyze the increase or decrease in the cost per unit if new units are produced. When the marginal cost starts to decrease it is said that the company achieved an economy of scale. What this means is that by reaching a higher scale of production the company can save costs. Also marginal costs can be increased; in this scenario the company must pay special attention since it can affect its profitability. The marginal cost is calculated by dividing the variation experienced in the total production cost after producing an additional number of units by the variation experienced in the quantity of units produced. This concept is regularly employed by manufacturing companies that produce tangible goods but it is also applicable to any product or service that can be measured in units somehow. Safety First LLC is a company that manufactures safety boots. The company is currently experiencing a sales boost because of the new job safety legislation that the government is implementing. The company has two standard models; one for men and the other one for women. The company is currently analyzing the possibility of expanding the production of male boots, since those are the ones with the most demand. They currently manufacture 1,000 units per month with a total cost of $23,000 and they are estimating what would be the marginal cost to produce 2,000, 5,000 and 10,000 units per month. The analysts determined that the cost to produce 2,000 units would be $45,000, for 5,000 units it would be $111,000 and it would cost $215,000 to produce 10,000 units per month. In this case, the marginal cost for each production level would be $22, $22 and $21.33 respectively. This means that any of these production levels will provide an economy of scale for the company; therefore, it would be positive to increase the number of units produced to take advantage of this market opportunity.